Where to Buy TriStar Insecticide, TriStar 8.5 SL Superior Foliar Insecticide - 4 oz - Qt - Gal - $32.95 for Sale with Fast Free Shipping! 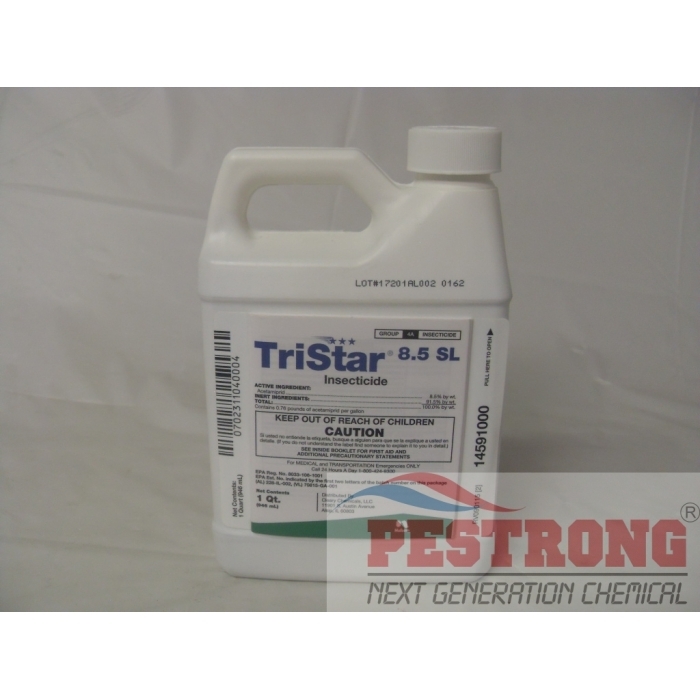 TriStar 8.5 SL Superior Foliar Insecticide - 4 oz - Qt - Gal has no odor and is a long-lasting, fast-acting, broad spectrum nicotinyl foliar insecticide. By buying this product & leave product review you can collect normally 59 reward points as a voucher of $5.90(1%). KleenGrow Disinfectant Fungicide - 1 - 5..
TriStar 8.5 SL Superior Foliar Insecticide - 4 oz - Qt - Galhas no odor and is a long-lasting, fast-acting, broad spectrum nicotinyl foliar insecticide and all your spraying applications covered – big and small. Provides the longest lasting foliar spray residual on the market today. Broad spectrum control of key insect pests like aphids, caterpillars, leafeating beetles (such as Japanese beetle), leaf miners, mealy bugs, scales (hard and soft), thrips and whiteflies. • Provides contact, systemic and translaminar activity to penetrate and protect the old and new growth. • Absorbs and spreads within the plant to provide quick knockdown of a wide spectrum of insects (in as little as 12 to 15 min. as a direct spray). • Long lasting residual. Up to 4 weeks on bedding plants, 4 to 6 weeks on woody ornamentals and trees (depending on the plant material). • TriStar exhibits ovicidal activity on select insects such as whitefly. • Good IPM and resistance management tool. Effective alternative to organophosphates, pyrethroids, and other classes of chemistry that may have developed resistance. • Excellent tank mix partner. Goes into solution easily and is compatible with most commonly used fungicides and miticides. • EPA classified as a reduced risk insecticide. • TriStar has a minor impact on many beneficial insects, including bees. • TriStar provides a higher level of worker safety as it is a non-cholinesterase inhibitor unlike organophosphates and carbamates. • 12 hr. REI for Nursery and Greenhouse sites. Re-entry for residential and commercial landscape is permitted when the application is dry. • TriStar has NO odor and is a long-lasting, fast-acting, broad spectrum nicotinyl foliar insecticide. This is so powerful! Such a small amount provides such great results! This is such a powerful liquid but there is no odor. I was expecting some kind of smell (even though it says there's no odor) but during mixing, spraying, and afterwards, there really was no strong smell. Almost immediately after spraying I noticed quite a number of dead insects. After a couple of hours the chemical took care of almost all visible pests. I am so glad I found this product!